A hilarious pseudo-history of marketing management, which explicitly denies resemblance to any actual history, and which will be horrified if some semblance be found. The story of a man who discovered that the path of life is strewn with treadmills and, if you get on one by mistake, you could keep running all your life to stay in the same place. The story of how a businessman may just be minding his...err...business and the 'Invisible Hand' can cause unexpected consequences to arise out of his innocent actions. There is no point blaming the tale for being exaggerated because that is precisely what it seeks to be - an 'exaggeratio ad absurdum' of some facets of the world. Anything you learn from the book - be it the basics of marketing management or a satirical view of Society - you do at your own risk. The tale only dogs the doings of Spike Fortune who only sought to feed dogs and, later, sought more dogs to feed. Jerry Fortune who, being fortuneless, gets dragged helter-skelter behind his uncle Spike in the latter's careening pursuit of commercial success and gets sandwiched between Spike and Tyke who was Spike's resident genius on enticing dogs with their wares. He also has to help Spike in his rivalry with Tom Rich, who is unwillingly dragged into upstaging Spike and tries to do it by teasing the palates of cats, helped by the bumbling efforts of Jasper Rich who would rather be partying than chasing cats with cat-foods. Born on 27 September 1963 in Chennai, Suresh can be a dithering Libran most of the times. A company town upbringing at Neyveli and Engineering at Annamali University, Chidambaram was leavened by management education at IIM-Bangalore and, later, working life at IFFCO, New Delhi. Having decided very early in life to write full-time after securing a financial future – which also incidentally meant that he remained single in order to make it as early as possible - he quit employment at the age of 41 and his consultancy at 43, and returned to Bangalore. He also has a short story published in a collection “Uff Ye Emotions” and has edited and written a novelette in an ebook anthology “Sirens spell danger”. He is more active on Facebook and can be accessed here. He does have a twitter handle - @CSuresh16 – but he has no handle on using it regularly. There is always a special place in my heart for books written by fellow bloggers, added to it the fact that some of them are such amazing authors that it is a pure joy reading their books. It feels proud to see them in print knowing that this is a very deserved progress for their writing. C Suresh is one such blogger. Having known him through social media I have had the chance to read his blogs very often. I have giggled and laughed at his thoughts on this otherwise dull world which is busy doing things of least importance. Suresh seems to have a special pair of glasses through which he makes his readers see this world and makes them notice things which otherwise till then went unnoticed. When I was approached to review his book it was a HUGE yes for me, who wouldn't want to add a healthy dose of laughter to their lives! The biggest plus for the author would be the way he makes a reader believe that whatever he is talking about is actually the real history that happened centuries ago in a defining moment. That is the power of his writing. Written in a very lucid language he ensures laughter from page one after which there is no stopping you. Despite being categorized as humour, this book is a very intelligent read. 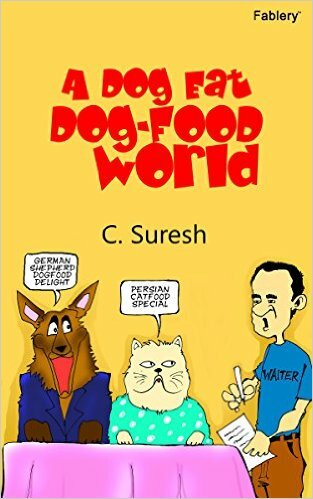 The humour we are talking about is not the usual slapstick humour, but a proper humourous writing which can easily be put next to P G Wodehouse and the likes purely for its quality. Off late the ability to laugh at a good decent joke or should I say to even get to hear one has become a far fetched reality because of the obvious reasons. But books like these reinstate the fact that humour writing is still existent is its original and wonderful form Kudos to writers like Suresh for having brought it back !